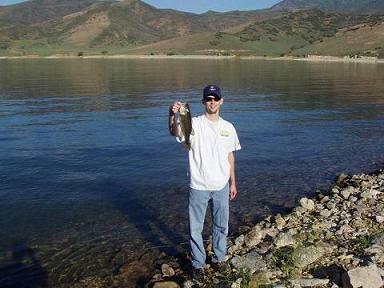 Largemouth Bass caught at Deer Creek Reservoir. The head is large and long. The mouth is large and terminal with the upper jaw reaching past the center of the eye in adults. The upper parts of the body and head are greenish with a silvery or brassy luster. The belly is white to yellow. There is an irregular dark stripe along the sides. The eyes are brown. Largemouth Bass are one of the most popular gamefish in the entire world. Countless clubs and tournaments are completely focused and dedicated to the largemouth bass. They can provide an excellent fight, and are present in many Utah waters. Largemouth bass, sometimes called black bass, linesides, greenfish, etc., along with Smallmouth Bass, are actually a member of the sunfish family.